TataSky DTH increased package price recharge subscription fees by 8%. The provider of direct to home television Indian DTH TataSky has increased its subscription fees to 8 per cent (Rs 370), for long-term dth recharge and for monthly pack recharge selected for the month. The move comes after rival television as Airtel DTH TV, Videocon D2H, Dish TV among others in the past month increased their DTH channels pack prices. 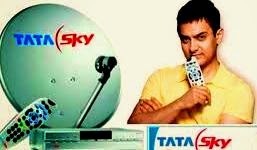 Tatasky subscribers will not have to pay the increased channel pack price for yhis month, which is estimated at Rs 220. While this move is a part of an annual exercise conducted to compensate for inflation, the company said. The direct to home TV tatasky said that they increased their TV channel pack price of Supreme Sports Kids pack for Rs 3520 from Rs 3150 earlier. And if a subscriber wants to subscribe the metro package, then he has to pay RS 220 more, that is the Rs 3960 now costs against Rs 3,740 earlier for the metro pack of TataSky DTH. Likewise TataSky increased annual fees of Dhamal cricket Music by Rs 100-2600 and the Grand Sports Pack of Rs 4950 from the pack price of Rs 4730. TataSky said the increase in the monthly plans of these packages varies from three to five percent.